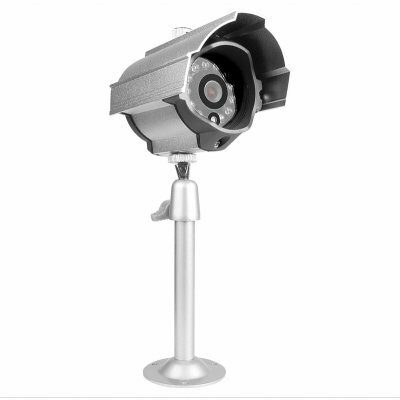 Successfully Added Waterproof Surveillance Camera with Night Vision (EU) to your Shopping Cart. Waterproof Surveillance Camera with Night Vision (EU). This waterproof surveillance camera is perfect for keeping an eye on your home or small business, day or night, rain or shine. If you are looking for an effective and economical surveillance system for the outside of your home or small business, look no further. This waterproof camera can provide the 24-hour outdoor surveillance solution you require at a price you can afford. Expecting unwelcome guests? Install the camera outside, aim it at your door, and screen visitors before they even knock. Point it at your car to see who's checking out your ride. Or place it outside your store to catch vandals in the act. With easy to install cameras, high-quality audio and video, and the ability to link to a TV monitor, the uses of this Wireless Surveillance Combo are limited only by your imagination. Setting up your waterproof surveillance camera is quick and simple. With two rotatable joints and a viewing distance of up to 15 meters, the camera can be easily aimed at any location. The extra long 30-meter cable means you can monitor the camera from a distance on a large screen..